ANGUAGE is a major component of the feast of Pentecost. This is obvious from the readings appointed for both the Vigil Mass and the Mass during the Day. Within these Scripture selections, there is a message for us to learn about vernacular liturgy. At the Vigil Mass, the first reading is taken from Genesis, chapter 11, where one finds the story of the Tower of Babel. The first line is striking: “The whole world spoke the same language, using the same words” (Genesis 11:1). The author seems mesmerized by the beautiful uniformity of this situation—a state of affairs that characterized the worship of the Roman Rite for many centuries. Later in the reading, on account of the people’s pride & rebellion, the Lord decides to “confuse their language, so that no one will understand the speech of another” (Genesis 11:7). In the first reading from the Mass during the Day, the story of Pentecost day is recounted from Acts, chapter 2. Interestingly, in this case, the people become “confused” because “each one heard [the disciples] speaking in his own language” (Acts 2:6). By the power of the Holy Spirit and the gift of tongues, people of all nations were enabled to hear and understand the Gospel message that day. Fifty years having passed since Sacrosanctum Concilium, it is difficult to understand how that document’s implementation happened the way it happened. This is the Vatican II Constitution that states: “the use of the Latin language is to be preserved in the Latin rites” (SC 36.1). Almost immediately after its release, however, the use of Latin in Catholic liturgy all but vanished. The Third Edition of the Roman Missal has made heroic strides towards a more “timeless English” for today’s worship in the Anglophone world, but Lewis’ point remains true. Shouldn’t liturgy be timeless? If so, then abundant use of vernacular languages will be a hindrance. There is a special arrogance which asserts that “people can’t understand” the liturgy unless it is celebrated in the vernacular. Do we really “understand” the liturgy, even in the vernacular? This usage of “understand” seems to imply a sense of total control over the liturgy and a marked absence of mystery. At the same time, the insinuation that the faithful are incapable of grasping at least the ordinary in Latin is, to my mind, brash. 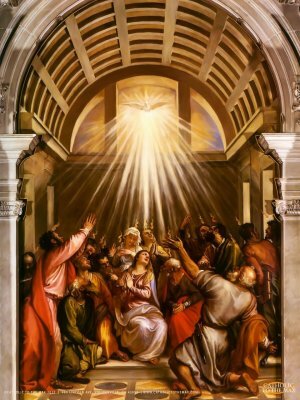 Some time ago, I published the story of how I came to love Latin liturgy, and this feast of Pentecost has brought those thoughts to the fore of my mind again. I never set out to love Latin; the conversion simply overtook me once I began to experience it. Do churchgoers of my generation—who, largely, have no experience of Latin in the liturgy at all—even recognize the gift that has been lost? Would they even understand the wonder & awe captured in the opening line of the Tower of Babel story? As I stood in line last July, waiting for the opportunity to concelebrate Mass on Copacabana Beach, I remember wondering to myself what language Pope Francis would choose for offering the closing Mass of World Youth Day. On other occasions, I have been to Masses with similarly international congregations during which (presumably in order to make everyone feel welcome) the organizers arranged for twelve intercessions to be spoken each in a different language by a person in native dress. On these occasions, my natural response has invariably been to recall that the Church, in her long wisdom, has an answer for such occasions. Why is it taboo, verboten, anathema in so many places to make use of Latin, which is so highly praised & respected by the Second Vatican Council? From the Tower of Babel, we can learn an appreciation for worldwide linguistic uniformity. Considering the story of Pentecost, we can gain admiration for a common language that people of diverse backgrounds can comprehend. Is it too much of a jump to recognize the value of Latin liturgy?